The East Sea - a FALSE history in our textbooks! 2. Korea was liberated in 1945, but Japan still refuses to return “East Sea” to its original identity. 3. Our veterans were the major force defeating Japan in World War II. We helped Korea to regain its freedom. 4. However, we are still teaching our children a FALSE history that was manipulated by the invader who attacked “Pearl Harbor”. 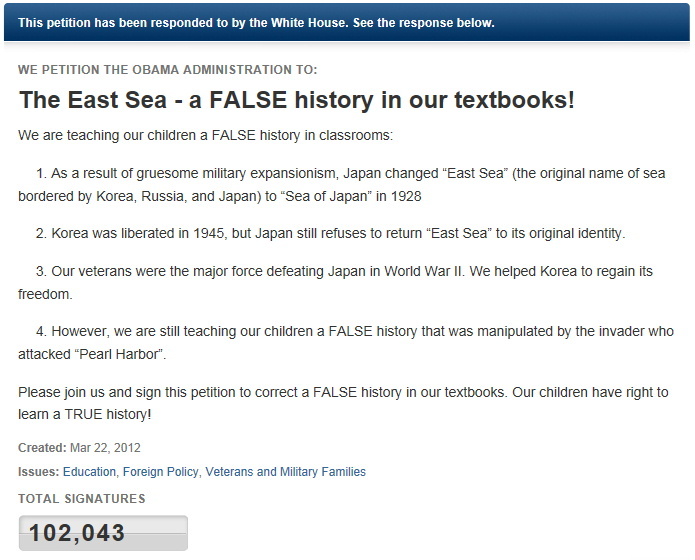 Please join us and sign this petition to correct a FALSE history in our textbooks. Our children have right to learn a TRUE history!